Join your friends and colleagues in the Office 365 Developer Program. Use the Office 365 developer subscription to develop your solutions independent of your production environment. You can build solutions for Microsoft Teams, Office Add-ins, Microsoft Graph, SharePoint Framework, SharePoint Add-ins, and more. 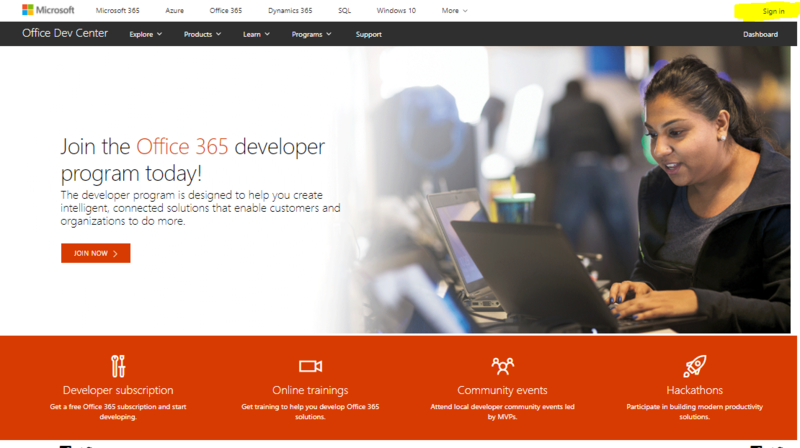 Go to the Join the Office 365 Developer Program page. In the upper-right corner, choose Sign in to sign in with your Microsoft account or Azure Active Directory-enabled email. After signing in, choose Join now. Review the terms and conditions. You'll need to select the check box before you can join. 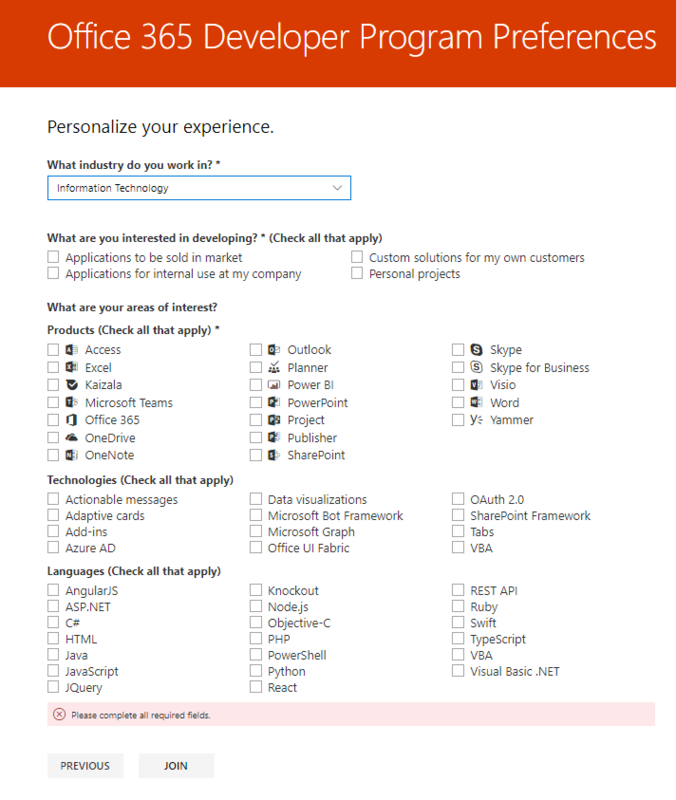 Optionally, select the I would like to hear from the Office 365 Developer Program check box if you want to hear from Microsoft about new capabilities and other updates. The industry that you work in. The type of applications or solutions that you're interested in developing. Products, technologies, and programming languages that you're interested in. When you're finished, choose Join. Your preferences appear on the next page in the top right, and you receive a Welcome message. 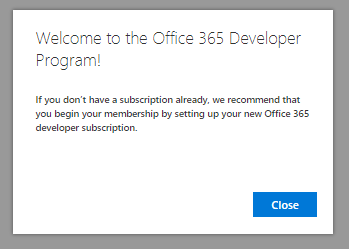 Set up an Office 365 developer subscription. After you have your developer subscription, use your subscription to build the types of solutions that you want. For information about expiring subscriptions, see Subscription expiration and renewal. 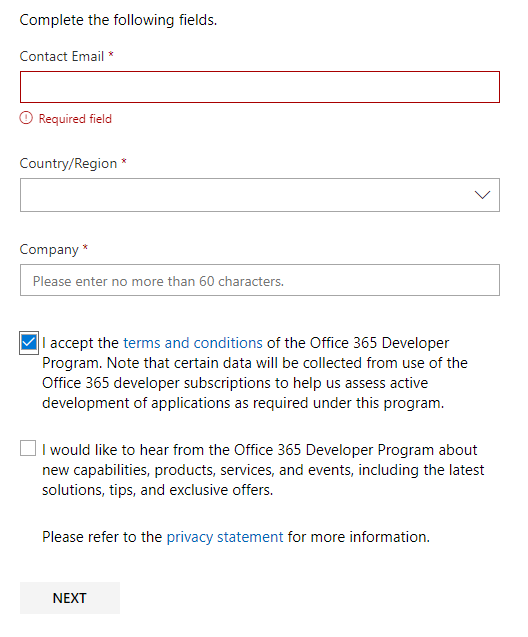 For frequently asked questions about the Office 365 Developer Program, see the FAQ.